Roman Catholic Church in Abbotsford B.C. St. Ann’s Roman Catholic Church is a community of approximately 1,200 families in Abbotsford, British Columbia. 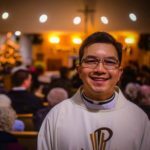 The Parish family is made up of over 50 nationalities, and they are excited to live out their Catholic faith with enthusiasm and love for their neighbours. The parish belongs to the Archdiocese of Vancouver and originally marked its boundaries as follows: to the north, by the Fraser River; to the south, by the Canada-USA border; to the east, by the Vedder Canal; and to the west by Mt. Lehman Road. It is comprised of a total of two hundred square miles of British Columbia’s scenic beauty. St. Ann’s is a very active parish community. With activities for all ages, there is something for everyone. Browse this site including the “Ministries and Groups” section and “News and Events” to see the many things that are happening throughout the year. Mass is celebrated daily and in several different languages. Thank you for redesigning our St. Ann’s Website. We are pleased to have a website that is modern and accommodating to different devices. We are very happy with Treefrog Digital of their professionalism and promptness in responding to the Website services. We are impress with the process of the reconstruction of the Site, that is Treefrog Digital has the ability to guide us in their expertise but at the same time put customer ideas and needs first. It also integrates the ideas into application seamlessly. Treefrog Digital is dependable, responsible, innovative, and inexpensive. As a whole we are more than satisfy and very happy with our new site. Treefrog Digital revamped the Parish website with a refreshing look. The main purpose of the new website was to keep their parishioners informed on what is going on, so using a CMS (WordPress) allowed the site administrators to post news, events and announcements easier so people can see that information right away on the main page or on the Calendar. The website is now responsive, so it would look good no matter the devices where you visit from. We also helped to incorporate social media channels like Facebook, Twitter and Instagram. We also incorporated a newsletter signup form, so parishioners can enrol to receive their weekly e-bulletin.